You might think that frogs are just little green creatures that go hippity-hop around your yard, especially in the Summer months. But, there are all kinds of frogs in a wide array of stunning colors from all over the world. Most of them are perfectly harmless, but there are some that are quite poisonous. That is the reason why you should not try to touch something just because it is cool looking. Just like a lot of beautiful things in nature, some things are better to be admired from afar. 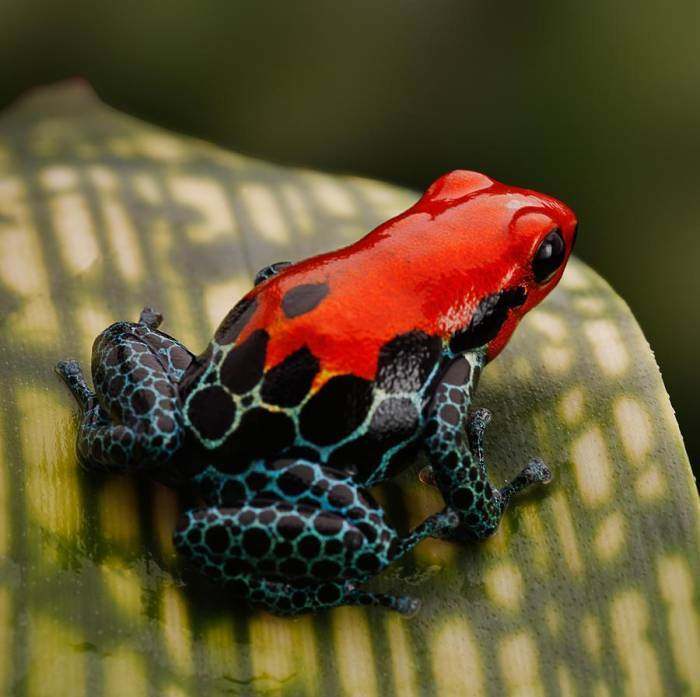 Red Poison Dart Frogs are also known as Strawberry Dart Frogs. They get their name because of the toxins that can be found in their skin. 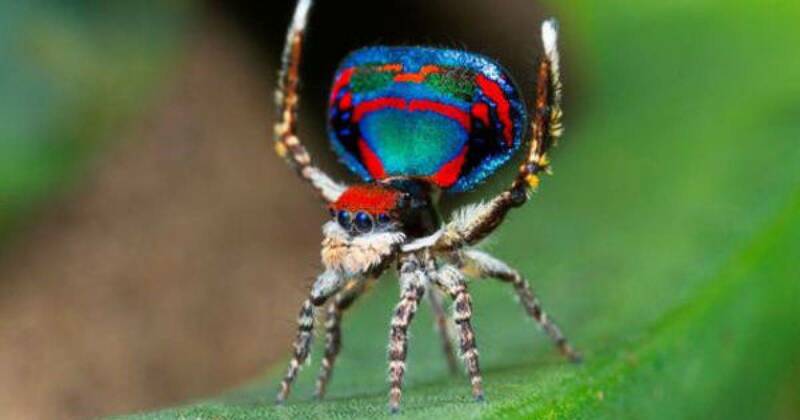 Their bright colors are a warning to potential predators that they should not eat them. One cool thing that we learned is that the male frogs from this species are actually really good dads. They guard and tend to the eggs after mating and work hard to keep the eggs moist whether they have to transport water or even pee on them to keep them wet until they finally hatch. This black and purple stunner is also known as the Clown Frog. It is primarily found in Panama and is currently on the critically endangered species list. It is another frog that is brightly colored in order to warn predators of its poisonous skin. He may look pretty, but it is best if you do not touch him. Now, this is one grumpy-looking frog. You might not be very tempted to touch him because of the way he looks, but don't all of those bumps on his body look fascinating? As you can probably guess, since he is not a pretty frog, he is pretty much harmless. The cool thing is that this frog when it feels threatened or is about to feed can puff out his body to double its normal size. This particular poison dart frog family can be found in a wide array of colors like orange, yellow, red, white and light blue. The bright colors are a way to warn predators that they are very toxic and are able to repel and kill small predators with that poison. These tiny frogs are only mostly just two centimeters in size and very hard to find. Even the largest ones that can grow to be just under two inches long live in such secluded areas, deep in dense jungles, that scientists have a hard time studying them. This species was discovered not too long ago, and sadly, they are already an endangered species. They can be found in Ecuador, but their fragile habitat and ecosystem are constantly being disrupted by simple things like dirt roads. Since the government there is planning more invasive work in the area, they might not be around much longer. The Goliath Frog is the largest frog in the world and can weigh more than seven pounds. This big boy eats a diet of frog tadpoles and prefers to hang out in the rivers and cascades of the rainforest. This species is endangered due to the rainforests being deforested for timber. While this species is not poisonous, it can be quite a handful to hold. This is another species of frog that can be quite large. They can be up to 5.5 inches and weigh up to one pound. They are often referred to as mouths with legs because their mouth takes up the whole front half of their bodies. While they are not poisonous, they do have teeth. Yes, I said teeth. They are found on the roof of its mouth and around the outside of its jaw. The Red Mantella Frog is also known as the Golden Mantella Frog. They can be bright red, orange, or yellow. They are poisonous as you can probably guess since they are another species of brightly colored frog. They are a small species, growing to be about an inch in length. They are native to central-eastern Madagascar and love to bask in the sunnier areas of the region.